Please take a few moments to browse through our extensive collection of custom softball clothing and apparel. 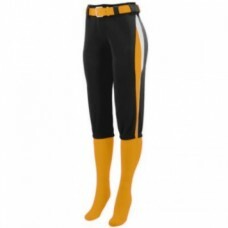 Whether you need custom girl's softball pants and shorts for a youth league or fast pitch softball uniforms for a men’s or women’s league, Shop4teams is here to fill your order fast and efficiently. Whatever your colors, logo, or budget, we can create a softball uniform package that meets your needs. Do you have questions about our prices, uniform availability, or process? Don't hesitate to contact us today. You can have brand new custom softball uniforms in as little as two weeks. Size chart Heavyweight 100% polyester brushed tricot * Covered elastic waistband with inside drawcor..
click here for Size Chart 14 ounce 100% polyester double knit* Girls' fit* Low rise* Elastic wais.. Size chart 100% polyester wicking mesh * Wicks moisture away from the body * Heat sealed label * Con.. Size chart 100% polyester double knit * 5 panel construction * 7 sewn-in EVA pads (hips, tail, thigh.. Size chart 100% polyester diamond mesh body * 100% polyester dazzle yoke and sleeves * V-neck collar.. Size chart . Dry-Excel Performance double knit is a 15 oz. polyester with wicking and soil-rele.. Size chart 14-ounce 100% polyester double knit. Girls' fit. Low rise. Elastic waistband with inside ..